The two most essential pieces of a successful business are profit and loss; if both of them are not tracked and managed constantly a business absolutely cannot be successful. Obviously a company wants to maximize profits in any way possible while also minimizing loss, but unless it is tracked properly nobody can do anything about it. That is exactly why the profit and loss template for Excel is a popular and powerful tool. The template is probably the best way to track both profit and loss and it really is a great addition to any business. Unlike many of the popular and powerful management tools out there, this profit and loss template is absolutely free to download and free to use. The template was created so that it could be quickly and easily modified or changed in any way you need to make it fit your business and it is absolutely the best tracking tool out there right now. Downloading and setting up the profit and loss template is as easy as opening up an Excel file and in a matter of seconds you will be ready to get to work. Using the profit and loss template is just as easy as setting it up. Simply start inputting various bits of information regarding sales, expenses, or other costs, and the template will begin to track everything you put in. Each of the categories that are available in the template is customizable so change them as you need to make them fit your business. Once you have everything input into the template you will see a final calculated value for net profit or loss, it is as easy as that. 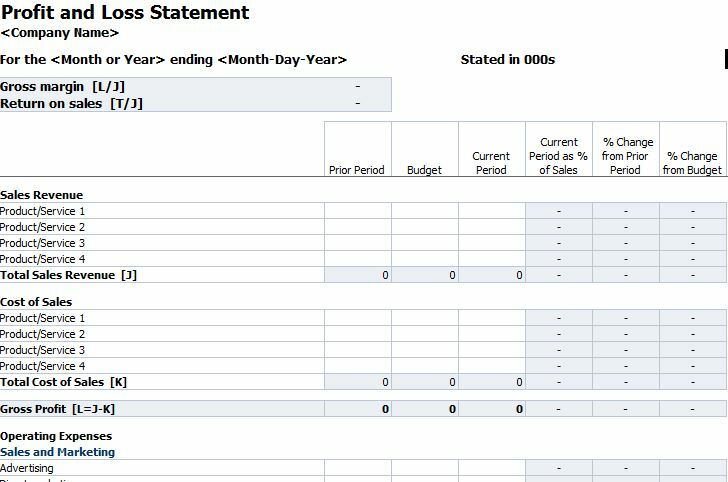 Keeping the template updated with current information will make it easy to see what is happening at your company and since the template is so easy to use it’ll always be up to date. No other profit and loss tracking system is as simple to use, simple to setup, or as cheap to obtain as this profit and loss template so why not give it a try today and see what your business could improve?